When a DITA map is opened in XMLmind XML Editor, the XML menu becomes the Map menu and this menu is populated with items which are specific to DITA maps. This reference contains a description of such menu items. What's described in this section also applies to DITA bookmaps. Displays a dialog box allowing to specify a conditional processing profile (a .ditaval file) which is to be applied to the map being edited and also the medium targeted by this map. The conditional processing profile is used by the Check Map command and also by all the Convert commands found in the Convert Document menu. The target medium specified in this dialog box is used only by the Check Map command. If you specifically target a print form (PDF, PostScript, RTF, etc) for your deliverable, check Print. In any other case, check Screen. Figure 1. The dialog box displayed by menu item "Conditional Processing Profile"
Note that the values specified in the above dialog box are remembered for use during subsequent editing sessions. For example, in the case of the above screenshot, if you reopen the same map later, this map will still be filtered by print.ditaval and its target medium will still be Print, and this even if you do not explicitly use menu item Map → Conditional Processing Profile during the new editing session. Extensively check the map being edited. This task which can be lengthy is run in background. While this task is running, a non-modal dialog box displays all the errors and warnings found in the map being edited, its submaps and all the topics referenced by these maps. 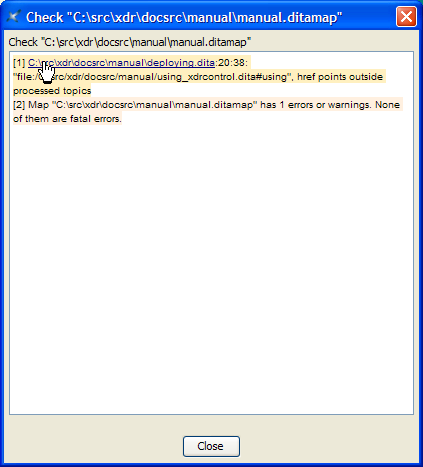 If no errors or warnings are found, the dialog box is automatically closed. Otherwise it stays opened allowing you to review each error or warning. After you are done, you'll have to close the dialog box by clicking Close if you want to be able to re-run Check Map. Figure 2. The dialog box displayed by menu item "Check Map"
As you can see it in the above screenshot, clicking on an underlined filename or URL opens the corresponding topic or map in XMLmind XML Editor and selects the element having the error or a warning. The items of this menu are all disabled if the document being edited needs to be saved to disk. Converts the document being edited to multi page or single page XHTML 1.0. Converts the document being edited to Web Help containing XHTML 5 pages. Converts the document being edited to a .chm file. This command is disabled on platforms other than Windows. Download and install Microsoft®'s HTML Help Workshop. Declare the HTML Help compiler, hhc.exe, as the helper application associated to files having a "hhp" extension. This can be specified by using the Preferences dialog box, Helper Applications section. Converts the document being edited to a .jar file for use by the Java™ Help system. Download and install JavaHelp . Declare the Java™ Help indexer, jhindexer (jhindexer.bat on Windows), as the helper application associated to files having a "application/x-java-help-index" MIME type. This can be specified by using the Preferences dialog box, Helper Applications section. Converts the document being edited to a directory containing various files for use by the Eclipse Help system. Converts the document being edited to an .epub file. Converts the document being edited to RTF (Rich Text Format) using. The document generated by this command can be edited and printed using Microsoft® Word 2000 and above. May require downloading and installing the "XMLmind FO Converter XSL-FO processor plug-in " add-on using Options → Install add-ons. Converts the document being edited to WordprocessingML. The document generated by this command can be edited and printed using Microsoft® Word 2003 and above. Same requirements as Convert to RTF. Converts the document being edited to Office Open XML (.docx file) . The document generated by this command can be edited and printed using Microsoft® Word 2007 and above. Converts the document being edited to OpenDocument (.odt file). The document generated by this command can be edited and printed using OpenOffice.org 2. Convert the document being edited to PDF. May require downloading and installing any of the following add-ons using Options → Install add-ons. RenderX XEP XSL-FO processor plug-in(1). There are three ways to change the look and contents of the files generated by the items of the Convert Document menu. Specifying custom XSLT stylesheet parameters. This is done by selecting any of the items of menu "Convert Document" and then, when the URL chooser dialog box is displayed, clicking "Document conversion parameters" to expand the conversion parameters pane. For example, adding parameter center with value "fig table" allows to center figures and tables in the generated files. The reference manual of the parameters of the XSLT stylesheets used to perform the conversion is found in XMLmind DITA Converter Manual - XSLT stylesheets parameters. This reference manual can be directly accessed from the "Document conversion parameters" pane. Using menu item Options → Customize Configuration → Customize Document Conversion Stylesheets is also a relatively simple way to influence the layout and style of the deliverable (PDF, RTF, HTML, etc) which results from the document conversion. invoke a specialized editor —XMLmind XSL Customizer— to modify a user-created XSLT stylesheet. invoke a helper application (generally, a text editor) to modify a user-created CSS stylesheet. To a lesser extent, changing the options of the XMLmind DITA Convert (ditac) preprocessor. This is done by using Options → Customize Configuration → Preprocessing Options. For example, selecting option group "Convert to PDF, PostScript" and then selecting "Generate as backmatter" in the Index combobox allows to add an index at the end of the generated PDF files. More information about this facility in Section 6. Preprocessing options. Note that a technical writer is not expected to know which parameter, option or style is to be specified to get the desired effect. Unless she/he is the local guru, a technical writer is expected to post a support request to the xmleditor-support public, moderated, mailing list in order to learn this. But at least the three above facilities allow her/him to customize her/his deliverables without having to hand edit configuration files. When a DITA map is opened in XMLmind XML Editor, buttons which are specific to this kind of document are automatically added to the tool bar. This reference contains a description of such buttons. Insert a topicref before selected topicref. 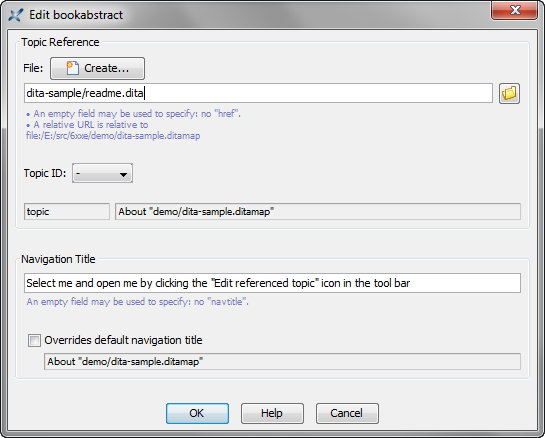 Displays a dialog box allowing to specify the @href attribute and/or the @navtitle of the topicref to be inserted. Insert a topicref as the last child of selected topicref. Displays a dialog box allowing to specify the @href attribute and/or the @navtitle of the topicref to be inserted. Insert a topicref after selected topicref. Displays a dialog box allowing to specify the @href attribute and/or the @navtitle of the topicref to be inserted. Displays a dialog box allowing to change the @href attribute and/or the @navtitle of selected topicref. Move selected element up, that is, swap it with its preceding sibling node. Requires the element to be explicitly selected. Move selected element down, that is, swap it with its following sibling node. Requires the element to be explicitly selected. Decrease the nesting level of selected topicref, possibly changing its type (e.g. a <topicref> element becomes a <chapter> element). Increase the nesting level of selected topicref, possibly changing its type (e.g. a <chapter> element becomes a <topicref> element). Displays a menu allowing to add a <reltable> without or with a <relheader> after selected element. The entries of this menu are generally disabled unless you select the last element (or any descendant of last element) of the map. Reltable column Displays a menu similar to the "Table column" menu found in Table editor. Reltable row Displays a menu similar to the "Table row" menu found in Table editor. Displays a menu containing "Show Level 1", "Show Level 2", ..., "Show Level 9" items. "Show Level N" means: expand all the collapsible elements of the map up to nesting level N and recursively collapse all the collapsible elements having a nesting level greater than N.
Opens in read-only mode the topic or map referenced in the selected topicref. Opens in normal read-write mode the topic or map referenced in the selected topicref. The following dialog box is displayed when you click the "Insert topicref Before", "Insert topicref Into", "Insert topicref After" or the "Edit topicref" toolbar buttons. See above. Click the Browse button and use the file chooser to select a file containing one or more DITA topics. After the topic file is selected, the status fields of the dialog box are updated to reflect the type and title of the first topic found in the file. The "Topic ID" combobox is updated too and contains the IDs of all the topics found in the selected file. In case the file selected in the previous step contains several topics, optionally select the ID of the target topic. This option adds a fragment #topic_ID to the value of the @href attribute. If you want to set the @href attribute of the edited or newly inserted <topicref> to a newly created topic, click the Create button. This displays the same dialog box as menu item File → New. Make sure to create a DITA topic. Type the title of the <topicref> in the "Navigation Title" field. Optionally click "Override default navigation title" if you want this <topicref> title to replace the referenced topic title in the deliverable (HTML, PDF, RTF, etc) which is to be generated out of the DITA map. This option adds a locktitle="yes" attribute to the edited or newly inserted <topicref>. When a DITA map is opened in XMLmind XML Editor, additional keyboard shortcuts which are specific to this kind of document are automatically made available to the user. This reference contains a description of such keyboard shortcuts. Up If a topicref is selected, select preceding topicref; elsewhere, default behavior. Down If a topicref is selected, select following topicref; elsewhere, default behavior. Double-click On a topicref, Edit Referenced Topic or Map; elsewhere default behavior. Drag Dragging selected topicref drags the value of its @href attribute. Elsewhere, default drag behavior. Drop Dropping a file or URL onto a topicref displays a popup menu containing Insert Topicref Before, Insert Topicref Into, Insert Topicref After, Edit Topicref and Cancel. Elsewhere, default drop behavior. (1) Unlike all the other add-ons, the RenderX XEP XSL-FO processor plug-in is not self-contained. You'll need to download, install and activate RenderX XEP (for example, free Personal Edition ) prior to using the RenderX XEP XSL-FO processor plug-in.